It's been a while since I've posted one of these! But I simply had to pass on a great find that has got me giddy as can be! I frequently talk about Clean Eating magazine, but what you may not know is how it all started. Tosca Reno, one of the colomnists for Oxygen magazine and a woman who overcame a huge battle of unhealthy behaviors at forty years old, wrote the book, The Eat Clean Diet. And along with that came the Cookbook and many other fantastic companions. I lived by this book when I first got it and it is still a constant reference. I just can't say enough good things about it! While reading my last issue of Oxygen, I came across an add for Tosca's new and enhanced version of The Eat Clean Cookbook and I am beside myself with excitment!! It has to be almost twice the size and full of new recipes. So, if you have not yet explored the world of Clean Eating, I would highly recommend you check this out! You won't be disapponted! 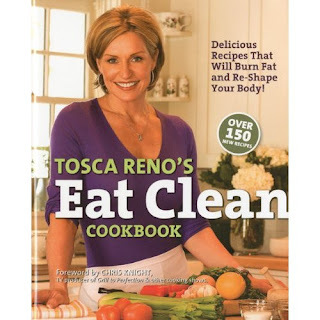 Tosca Reno's Eat Clean Cookbook: Delicious Recipes That Will Burn Fat and Re-Shape Your Body! And on that note, I want to divulge the super simple soup I made last night. Bring the tomatoes and broth to a boil in a large pot over medium-high heat. Simmer 10 minutes. Cook meatballs as instructed. Add pasta, spinach and Italian seasoning and cook until the pasta is tender, about 8 minutes. Add meatballs. Season to taste with salt and pepper. Ladle into bowls and serve. Sprinkle with Parmesan if desired. Like I said, super simple and also super tasty! You Gotta Have the Zest!